Founded in 1984 by graduates of various Swiss conservatories, the Basel Chamber Orchestra now ranks among Europe’s most highly acclaimed chamber orchestras. The BCO is committed to cultivating the chamber orchestra tradition bequeathed on Basel by Paul Sacher, one of the most important music patrons of the twentieth century. In 1926, [Sacher] achieved his first major ambition: on 4 November his Basler Kammerorchester (Basle Chamber Orchestra - BCO) was officially founded. Lesley Stephenson then goes on to describe how Sacher's orchestra was disbanded in 1987, three years after the founding of the 'new' BCO, when its patron withdrew his personal funding. But let's ignore the confusing dates and instead dig a little deeper. Paul Sacher (1906-1999) was a conductor and early music champion but is best known for commissioning works from Igor Stravinsky, Richard Strauss, Béla Bartók, Bohuslav Martinů, Elliott Carter, Harrison Birtwistle and others. In 1983 Sacher purchased a substantial part of Stravinsky's legacy including original scores and correspondence for US dollars 5.25 million and went on to buy manuscripts of Anton Webern, Elliott Cartet, Lucian Berio, Pierre Boulez and others. These form the basis of the Paul Sacher Foundation which owns one of the most important collections of contemporary music manuscripts. Towards the end of his life Paul Sacher was reported to be one of the richest men in the world. Sacher had been born into a modest household in Basel but in 1934 he had married the the Hoffmann-La Roche heiress Maja Hoffmann-Stehlin. The pharmaceutical giant's products include Valium and the company has been linked to a number of controversies including vitamin price fixing in the 1970s and the Seveso disaster in Italy in 1976 which caused a large dioxin contamination. In the US Roche markets the cancer and skin condition medication isotretinoin under the brand name Roaccutane and this has been linked to birth defects when taken by pregnant women. Roche Bioscience was created in 1994 following the company's acquisition of Syntex, a pioneer in the development of oral contraceptives. For almost 60 years, from 1938 until his retirement in 1996, Mr Sacher was an active member of the board of Roche and so only too aware of the controversies that seemed constantly to dog the profitable pharmaceutical group... Yet somehow none of these rows besmirched Mr Sacher’s reputation. But this path, like drugs, needs to be taken with caution. Hoffman-La Roche's sometimes controversial past must be counterbalanced by the company's continuing contribution to global healthcare. Paul Sacher facilitated the creation of some of the 20th century's greatest music. Despite the unexplained overlap of dates the only link between the 1926 and 1984 Basle Chamber Orchestras seems to be their name and a commitment to Paul Sacher's musical vision. 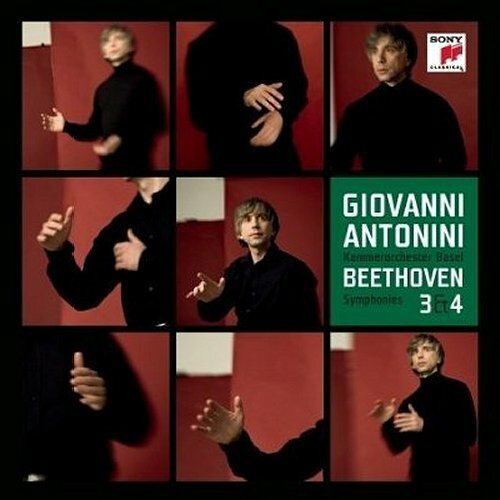 And a new Beethoven Symphony cycle, particularly from an independent label, is always welcome. However the story of Paul Sacher and his Foundation, which today controls, inter alia, the Stravinsky estate, is a thought provoking example of the role of the commerial-intermediary complex in classical music. * The Beethoven Symphony cycle from the Basle Chamber Orchestra follows recent cycles from Ivan Fischer and the Budapest Festival Orchestra, Paavo Järvi and the Deutsche Kammerphilharmonie Bremen, Osmo Vänskä and the Minnesota Orchestra, Phillippe Herreweghe and the Royal Flemish Philharmonic and Thomas Dausgaard and the Swedish Chamber Orchestra. Which puts into perspective this prediction from five years ago - 'in fact, no label had issued a (Beethoven) symphonic cycle in three years, and none was likely to do so again'. 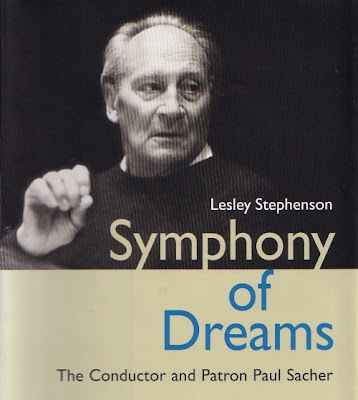 ** Lesley Stephenson's overtly partisan Symphony of Dreams - the Conductor and Patron Paul Sacher was published in 1992 by the Swiss imprint Rüffer & Rub, ISBN 9783907625101. Basel (English and German) and Basle (French) are alternative spellings for the same Swiss city. No review materials were used in the preparation of this article. Any copyrighted material on these pages is included as "fair use", for the purpose of study, review or critical analysis only, and will be removed at the request of copyright owner(s). Report broken links, missing images and errors to - overgrownpath at hotmail dot co dot uk Also on Twitter and Facebook. I'm sure it's very fine, but they'll have to do without my welcome. I'm about a year into a personal Beethoven/Mozart Boycott. I got so weary of the play-it-safe approach and lack of imagination of some major concert, recording, and broadcasting organizations that I signed out. One response could be that I'm clearly not in their "target demographic." That's fine by me. If this is what "they" have determined is the way of the future, good luck to them. This is not meant to sound bitter or to demand anything from anybody. I'm doing just fine with lesser-known musicians, small independent labels, and Internet radio! "Roche Bioscience was created in 1994 following the company's acquisition of Syntex, a pioneer in the development of oral contraceptives". Yes OK, maybe I should stop reading the Sun.